Experience the world's first ever 3D audio enhanced ebook. Be transported through history and the globe by specially created sound pieces that play with your spatial awareness to amplify iconic scenes from Ken Follett's brand new epic of love, hatred, war and revolution, Fall of Giants. From the dirt and danger of a coal mine to the glittering chandeliers of a palace, from the cramped factories of East London to the horrifying setting of the First World War trenches, fully immerse yourself in the story with the help of these audio clips created by award winning sound artist Nick Ryan. Put on your headphones and let the unique audio experience accompany you through a plot of unfolding drama and intriguing complexity. 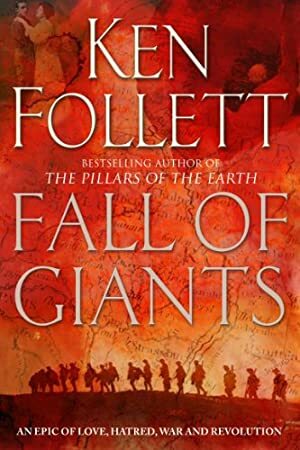 In addition, this enhanced edition of Fall of Giants contains exclusive material which gives an insight into how Ken Follett wrote the book. Features include video interviews with Ken, archive footage, and photos of historical characters. Fall of Giants follows five families through the world-shaking dramas of the First World War, the Russian Revolution, and the struggle for votes for women. Track It. This book has been £4.74 within the past year. Log In to track Ken Follett on eReaderIQ. to be notified each time the price drops on any book by Ken Follett. to stop tracking Ken Follett. We started tracking this book on January 21, 2013. This book was £5.98 when we started tracking it. The price of this book has changed 150 times in the past 2,282 days. The current price of this book is £5.03 last checked 4 hours ago. This lowest price this book has been offered at in the past year is £4.74. The lowest price to date was £1.09 last reached on November 25, 2016. This book has been £1.09 one time since we started tracking it. The highest price to date was £8.05 last reached on August 8, 2013. This book has been £8.05 2 times since we started tracking it. We last verified the price of this book about 4 hours ago. At that time, the price was £5.03. This price is subject to change. The price displayed on the Amazon.co.uk website at the time of purchase is the price you will pay for this book. Please confirm the price before making any purchases.